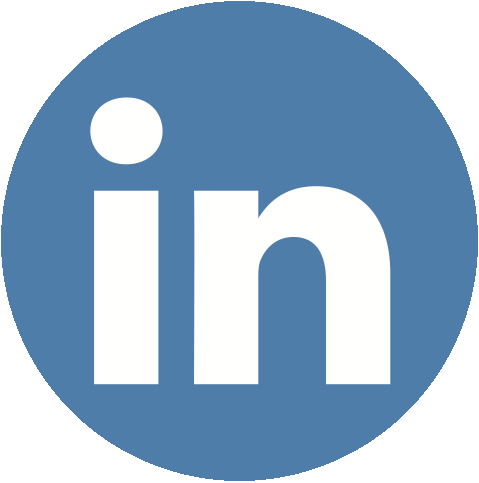 Ad fraud is a multi-billion dollar problem that has infiltrated every corner of the digital ad ecosystem, including desktop and mobile web, mobile in-app, and the rapidly expanding world of Connected TV/OTT. Here’s a sampling of some of the topics covered in eMarketer’s robust report. eMarketer dedicates a section of its latest report to Connected TV/OTT ad fraud, an area of growing concern among marketers as CTV/OTT becomes a bigger part of campaign success. "In a Q3 2018 study, Pixalate found that 19% of worldwide OTT impressions were invalid, due to a combination of fraud and ad serving and measurement errors caused by technical malfunctions,” wrote eMarketer in a separate article focused on the growing threat of OTT ad fraud. The ad industry needs to prepare itself for the battle against ad fraud in CTV/OTT. To that end, Pixalate recently hosted a webinar featuring experts from RhythmOne, Telaria, and Bold Screen Media to dissect the OTT landscape and educate the marketplace on how to grow scale without sacrificing quality. 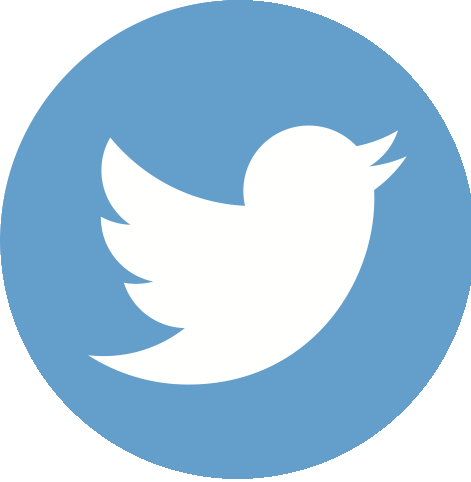 Read the webinar recap. Pixalate also released a comprehensive guide to OTT ad fraud in 2019, featuring more on the state of ad fraud in OTT, myths vs. realities, a breakdown of why OTT fraud schemes are harder to detect, and more. 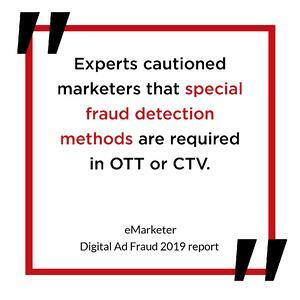 "Experts cautioned marketers that special fraud detection methods are required in OTT or CTV,” the new eMarketer report says.  Pixalate recently became the first (and currently only) company accredited by the MRC for the detection and filtration of video invalid traffic in OTT. The 2019 Ad Fraud Report from eMarketer also highlights current ad fraud rates across devices, featuring data from Pixalate’s Q3 2018 Ad Fraud Report. 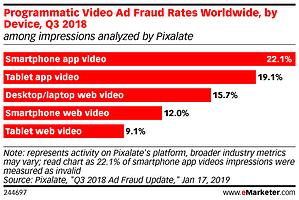 According to Pixalate’s Q3 2018 Ad Fraud report, smartphone app video (22%) and tablet app video (19%) had the highest video IVT rates. 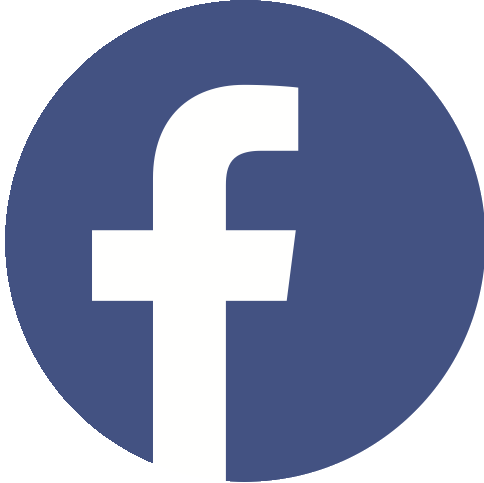 Those have been the two riskiest video channels for two straight quarters, proving that in-app advertising is a minefield of fraud and emphasizing the importance of working with a partner accredited for mobile in-app invalid traffic detection and filtration. Pixalate’s MegaCast discovery — perhaps the largest example of apparent mobile in-app ad fraud uncovered in 2018 — illustrates the challenges marketers face in-app. eMarketer’s 2019 Ad Fraud Report doesn’t just highlight the challenges. The report also makes note of the strides the industry has made the overall battle against ad fraud — specifically ads.txt, the IAB-led initiative that aims to reduce domain spoofing. "[Ads.txt’s] implementation has probably been the single most important development in fraud mitigation efforts since our last report was published in mid-2017,” writes eMarketer. 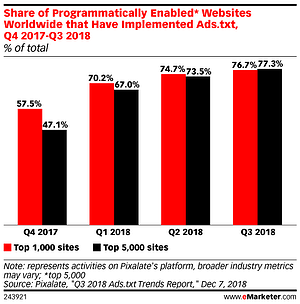 Per Pixalate’s Q3 2018 Ads.txt Trends Report, over three-fourths of leading programmatic publishes worldwide have implemented ads.txt. eMarketer does caution, however, the ads.txt is not a one-stop-shop solution to all ad fraud. "Ads.txt doesn’t fix or fight all types of fraud—it’s limited to web environments, for one thing, and for another, it aims only to weed out domain spoofing and arbitrage,” the report notes.